Regular Show is wonder cartoon brought to us by Cartoon Network. 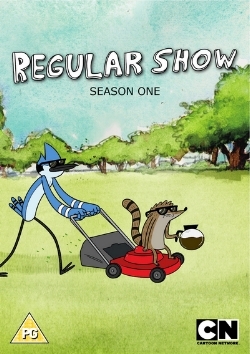 The show follows Mordecai and Rigby. Two employees of the town park who are much more interested in being cool then ever doing work. Due to their lazy attitudes they are always looking for the easy way out. Unfortunately these choice always seem to lead them into some strange kinds of trouble. Just things like teleporting coworkers to the moon, battling a video game villain, and even fight a cassette tape of the worlds most annoying song. I mean we have all been there right? This was one of the most creative and original cartoons I seen in a long time when it first came out. They had an amazing way of taking small annoying things and making them chaotic events. It also spark some creative new lingo that are fun to just shout out. I’m sure some parents really hate this show for a few ticks the characters have. Viiiiidddddeeeeeeooooo Gaaaaaammmmeessss! If you want to check it out head over to Cartoon Networks site or go pick up a season on DVD. Any season is well worth the buy.